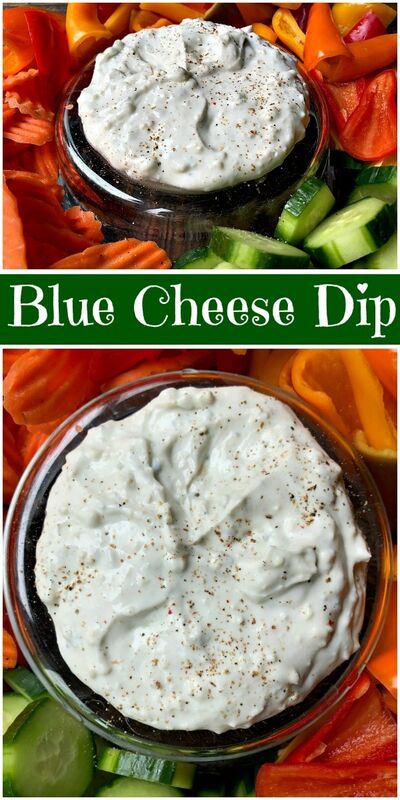 Here’s a Blue Cheese Dip recipe that is super easy to make, and it’s so delicious! Call me crazy, but I could eat this blue cheese dip by the spoonful. I blame my Dad for that. He made homemade Blue Cheese Dip all the time when I was little, and I became addicted to it at a very young age. 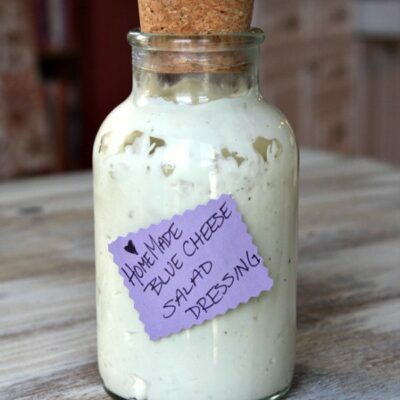 We loved blue cheese salad dressing in our house, so this dip wasn’t that far of a stretch. 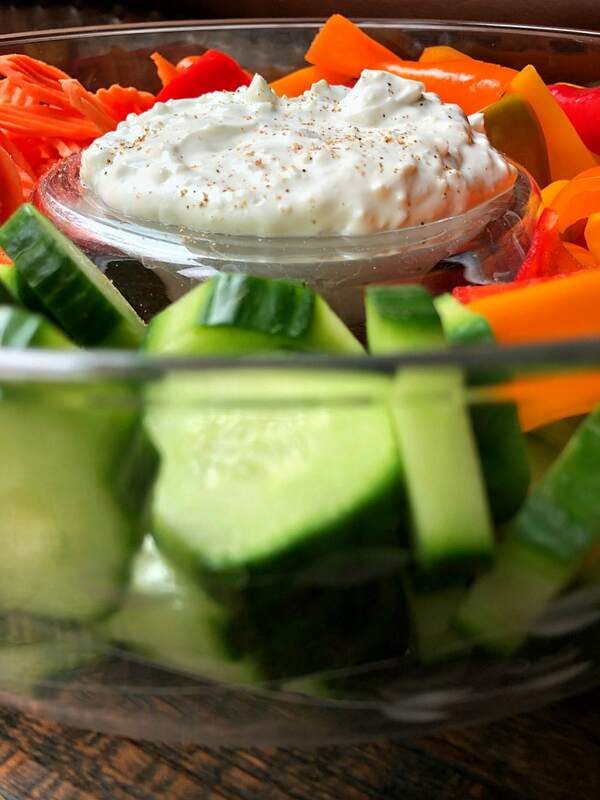 On football Sundays, I always stretched out on the couch with my Dad and nibbled veggies dipped in his blue cheese dip! Nowadays, I make blue cheese dip for parties. 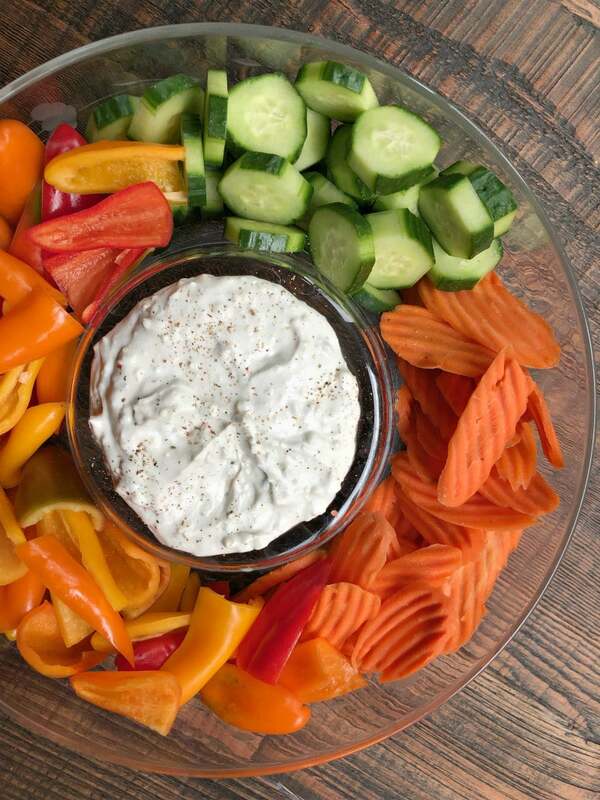 It’s easy enough to make and contribute to a party you’re attending, and it’s easy enough to make and serve as a dip with vegetables at your own party. How do you make Blue Cheese Dip? Minced garlic is mashed with Kosher salt. 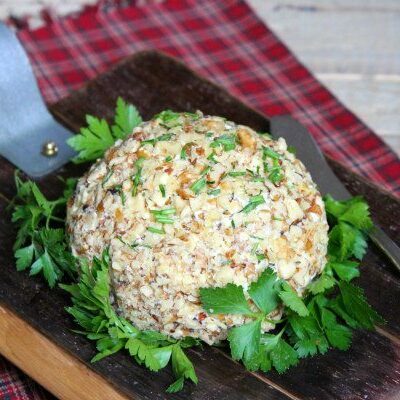 Blue cheese crumbles are added to the garlic. I like to use a GOOD quality blue cheese. It makes all the difference! Sour cream and heavy whipping cream are mixed in too. This dip thickens when chilled, but it thins out again when the dip comes to room temperature. 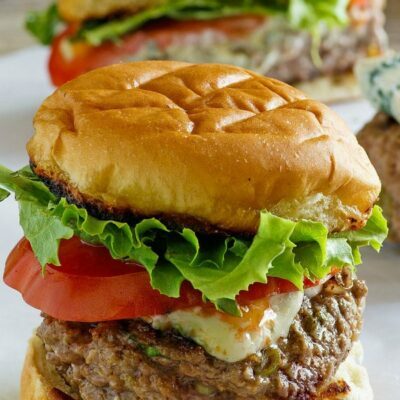 What can you serve with Blue Cheese Dip? 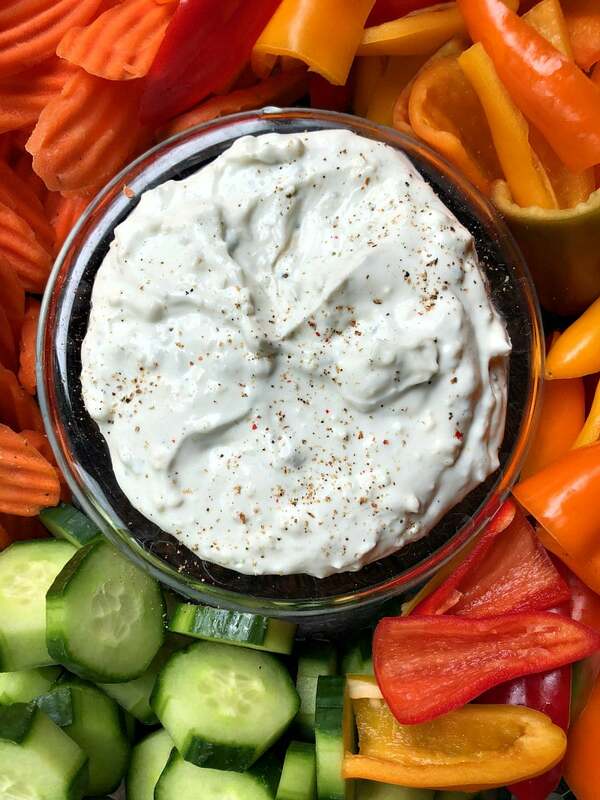 Fresh vegetables are perfect for dipping in this dip. A colorful array of carrots, bell pepper, celery, broccoli- whatever you’d like. They’re all a good pairing with blue cheese. Alternately, you can use this dip for dunking hot chicken wings. The heat of the sauce of the wings is cooled off by the tangy dip. It’s definitely a classic pairing. If you’re looking for more dip recipes, you might enjoy trying my Beer and Bacon Dip or this Buffalo Chicken Dip. 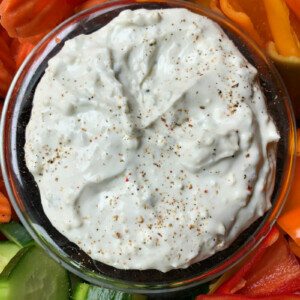 White Bean Dip, Curry Dill Dip and Avocado- Feta Dip are also delicious dip recipes! 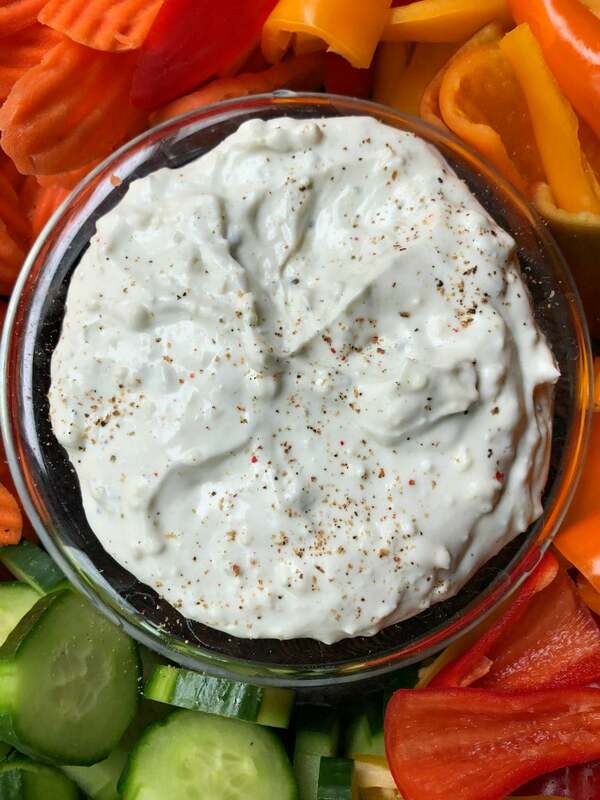 This blue cheese dip is perfect for serving with fresh vegetables or as a dip for hot chicken wings. In a medium bowl, use a spoon to mash the garlic with a pinch of kosher salt. Crumble the blue cheese apart and add to the bowl. Roughly mash the cheese with the back of the spoon (it's okay to leave some chunks). Stir in the sour cream and several grinds of pepper, and then add the cream until the consistency is slightly thinner than sour cream. Taste and add more salt or pepper if needed. Refrigerate until shortly before serving. The dip will thicken in the refrigerator but will return to its original consistency as it comes to room temperature. 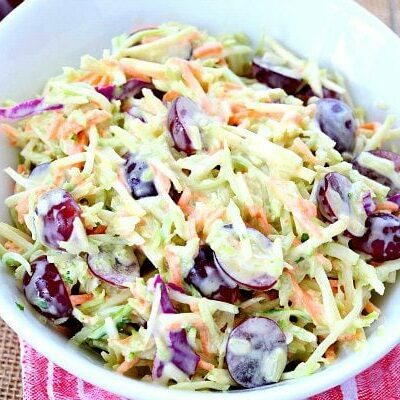 Serve with assorted vegetables.